Our villa, is located in a cul-de-sac, which is very private & not overlooked, offering all round views of the outstanding Almerian countryside. Complete with 3 bedrooms, two of which offer en-suite facilities and also a separate family bathroom. Our villa also has a lovely private swimming pool complete with Roman steps and also we have a six seater jacuzzi all of which are set in lovely gardens. This provides a perfect setting for alfresco dining and entertaining. The villa is furnished to the highest standard & air-conditioned throughout. Our villa is spacious and also has a 3000 litre water depositor, which provides an essential back-up during water shortages and a filter providing safe drinking water. The Surrounding area. : Our villa is ideal for families, hill walkers or those just looking for a relaxing holiday. In our village you will find a selection of bars, restaurants,supermarkets, pharmacy, postoffice, doctors, dentist and a new opened bowling alley just a short drive away. Ski in the Sierra Nevada mountains! Granada is around is 2 hours drive away. Fantastic golf facilities available nearby at the renowned Val de Este course and complex (20 minutes drive) and the Desert Springs Course and Resort (20-25 minutes drive). Upon Arrival/Upon depature: You will be met by one of our staff on your first day at an agreed location. They will show you everything about the villa. Please note the villa will be ready from 1500 hours on your first day. The villa will need to be vacated by 1100am on your last day. You will need to hand the keys back to our staff. Who will agree a suitable time to meet you. Extras at No extra cost to you...: As standard we provide all beach towels thus giving you extra space in your case! ***Please request at the time of booking, this way we can ensure the cot is set up for you and the high-chair is out for you. All bathrooms have a large illuminated mirror.The main ensuite has a large shower which is tiled very tastefully. The 2nd ensuite is very large with a bath/shower etc... The family bathroom has a bath/shower. Wifi available for an additonal £15.00 per week. For safety reasons please ensure children are kept away from this and are supervised at all times whilst the fire is on. Despite the recent switch in satellites meaning that properties in the Andalucía region can no longer receive UK television, we confirm that we can continue to receive all UK channels. A small selection of adult and children's titles. Tennis courts can be found in Arboleas. These are located by the comminity swimming pool. We have our own 8 metre x 4 metre private pool - Children must be supervised at all times. Thank you. What a lovely place to spend some time. From the first contact with David the owner to meeting Richard and Jenny to take you to the villa and check out. Richard and Jenny are more than happy to give you any information you may need as they live locally. The villa is very well equipt and there is everything that you should need. The villa is extremely clean with all you would expect and more. The pool is great for cooling down and the spa finishes the day off! I would definitely recommend this villa and will return myself one day I'm sure. Book with confidence you will not be disappointed! This was a last minute booking for us and the kids and David couldn’t have been more helpful and communicative with arrangements and recommendations. Jenny and Richard who look after the villa were more than helpful and very chatty and welcoming - especially with the provisions and cold beer and wine. Villa is lovely, clean and spacious and very well kitted out - plenty of room for the 4 of us (2 good sized doubles and a twin) with a great kitchen and eating and relaxing space. Pool and outside space is a good size and we spent a lot of time in and around the villa as well as travels around to various locations. It’s in a very quiet location but with easy access to Arboleas and the main road. We loved our 12 days there and would thoroughly recommended this villa to anyone. This was our first stay in arboleas,very impressed with the villa,couldn't fault it at all,everything that u would need for your stay was there,apart from food of course.coviran supermarket wasn't to far away and we had a couple of trips to Lidl and mercadona supermarket in albox which is closer than we originally thought and I must add a decent car is a must as it is a bit hilly.Richard and Jenny were really good,had a couple of small teething problems our first week,they were a call away and came straight away and put us right.our sheets and towels were changed by Jenny after being there for a week which we were not expecting! Richard cleaned the pool at the same time then they left us to it.The pool area was lovely,very peaceful heard nothing but birds all day! There were lots of different things to enjoy lilos etc.. in the shed left by the owners.we highly recommend this villa very quiet,relaxing and tastefully decorated 10/10 from us!! will hopefully be returning next year,thankyou for a great stay. We've stayed in many villas for holiday breaks and if you're looking for something that won't disappoint - book! Communication and assistance - 1st class. Villa Specs, cleanliness and equipment - 1st class. Everything is as exactly described. A car is essential to get out and about. It's a very quiet and peaceful location. If anything, the pictures undersell the property. The pool and hot tub are great and I can't think of a better place to be to lay back and soak in a fantastic night sky. If we're back in this region anytime soon we won't hesitate to get in touch to check availability. Everything was as described and more. immaculate, quiet, relaxing and pool and hot tub were amazing. whole family unwound and kids happy as had wifi . Jenny, Richard, Margaret, Brian all on hand for any issue and local advice. felt from second walked through door it was home from home. 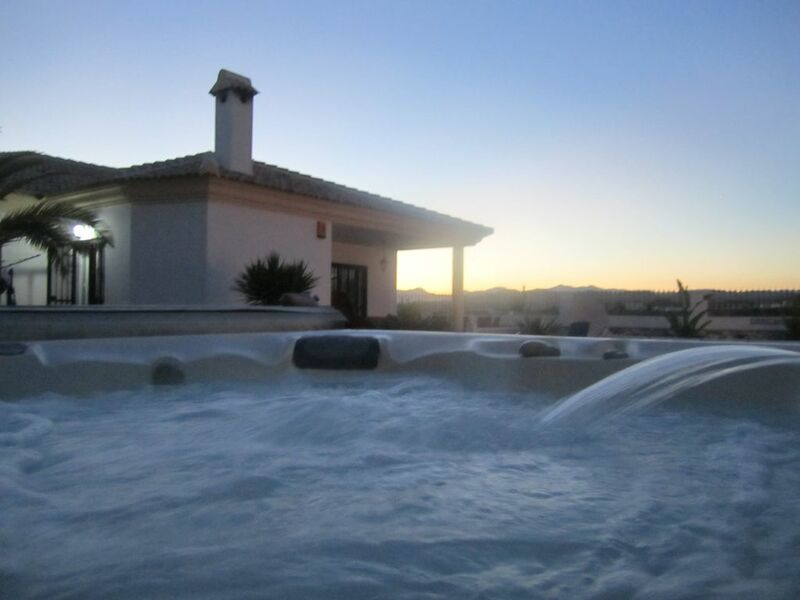 The villa, is located in Arboleas, which is 30 minutes from Mojacar and its wonderful golden beaches that go on for miles, with its golf course, bars, restaurants, commercial centre which is very cosmopolitan, go-karting and diving are also located within this area. With the famous Mojacar Pueblo where many artist hang their art work within this magical white village within the hills. Garrucha is just a five minutes from Mojacar on the coast wit excellent bars and fish restaurants, In the summer, a night time market lines the promenade which is fun for all the family. Here you will find fantastic art work, jewellery. You can also catch a boat trip around the marina. In Vera you will Tennis courts, beaches that go on and on... a water park, tennis courts, bars, restaurants and much much more... In Vera there is also a small nudist beach for those people who are brave. A couple of units up from this is Amigos Bowling Alley. Saturday Market, Bars and restaurants. 25% non refundable deposit due with immediate effect, a further 25% is due 6 months prior to departure and the balance is due 3 months prior to departure. Please note these monies are non refundable. A security deposit of £500.00, must be received.4 full weeks prior to arrival. Once we have had confirmation that the house has no been left in good order without damages or excess cleaning.